The film drifts on a performance from Crudup that isn’t so spectacular so much as the loudest instrument in the movie’s atmosphere. Crudup certainly acts as to how Macy directs, in an obvious way on a simple background. Fittingly, Crudup’s best moment is not anything during the movie when he is coming out of his shell, but his final performance towards the end of the film - a restrained moment that provides smoother catharsis and emotional recognition, without the obviousness. Macy’s first endeavor behind the camera is memorable in the wrong ways. It hopes to coast on tidy presentations of themes that don’t compact well, like with its clichéd images of grief that makes its supposed narrative gravity as cheesy as its presentation of warm open mic nights. With the movie reveling in its lightness, it rarely has substance in the place of its many conceits, save for the specific moment that asks its most interesting, if not only question - is it wrong for the father to cover the son’s songs, not because the father didn’t write them, but because of who his son is? A fluttering story about escaping the past suddenly presents the hard quandary of an artist’s personal life right to a surprised general audience, and it makes for Macy’s most effective scene, albeit a minute before the credits start to roll. Ironic to this intent, however, is the film’s own take on music. Fitting to the way it makes open mics at small bars seem like the hippest place to be, “Rudderless” is musical sap that just thinks guitars and bands and Kings of Leon-like songs are cool. Music is used in the film as a type of power, but with schmaltzy intent, like when the band uses music to impress two girls, or later when Crudup tries to cause rebel hell at a prissy boat show by rocking out on a speeding unmanned boat. The breeziness of “Rudderless” then nudges toward Macy having a teenager’s understanding of what music’s potential is - a dismissible quality if one is looking to see a movie about music’s ability to change lives that treats music like the choice to wear a fedora. “Rudderless” is indeed the story of a man finding his direction, albeit through the music and lyrics of his late son Joshua (Miles Heizer). Two years after losing his son to a school shooting, disillusioned father and ex-husband Sam (Billy Crudup) lives alone on a boat that indeed does not have a rudder. He has abandoned his fancy corporate job to become a house painter. When his ex-wife Emily (Felicity Huffman) gives him the remaining items belonging to their son, Sam discovers a batch of demos made by Josh that no one has ever heard before. Finding comfort in hearing his son’s music and learning it on his guitar, Sam decides to play one of Josh’s songs at an open mic. After his first performance, Sam catches the adoration of shy young musician Quentin (Anton Yelchin), who prods the reclusive man to start a band with him, using Sam’s material. When Quentin shows hims the effect that harmony has on a song (or, how human beings need others to be happy), Sam agrees, and they start a group with two others (including someone played by “Wasted and Ready” rocker Ben Kweller) called Rudderless. Sam’s songs are elevated from brooding single-acoustic tracks to Kings of Leon-like anthems with galloping drums and multiple harmonies. In the process, Sam becomes more extroverted, and befriends people like music shop owner Del (Laurence Fishburne), while playing Saturday nights at a bar owned by Trill (director Macy, shown wearing a fedora after a scene in which Crudup tells Yelchin that “style builds confidence”). All the while, Sam withholds the truth of who wrote the songs they’re performing, digging himself into a false image of getting away from his past. 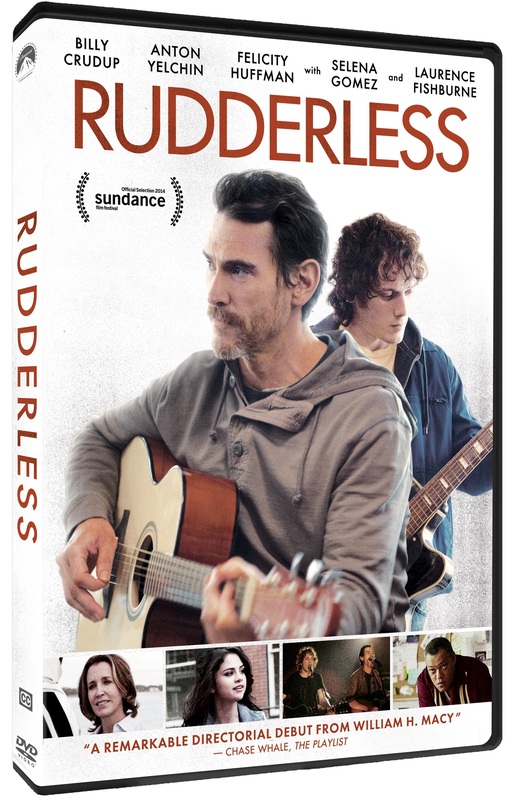 ”Rudderless” was released on DVD on January 20, 2015.